The Coolerado Energy Recovery Ventilator (ERV) supplies ASHRAE Standard 62.1 ventilation rates while dramatically reducing energy consumption. The Coolerado ERV can be installed separately or in series with a roof top unit (RTU). During summer months, HMX technology leverages work already done in conditioning the space to go beyond the tempering provided by typical ERVs, thus making it a super cooling unit. 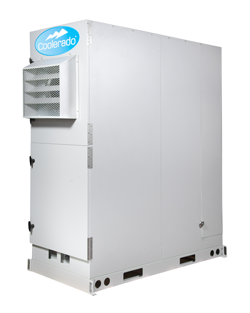 This powerful configuration enables Coolerado’s ERV to supply fresh air at 65 F, even in the hottest weather, in contrast to the 85 F typical from other ERVs, and significant dehumidification in humid weather. During the winter months, the unit pre-heats fresh air as a conventional HRV. The year-round savings and ability to dehumidify make the Coolerado ERV cost effective everywhere, including mild or humid climates. Regardless of season, the exhaust air and the outdoor air never mix within the ERV because the HMX uses different channels for both air flows thus maximizing indoor air quality (IAQ). The Coolerado ERV is ready for installation on custom commercial roof curbs. The unit comes with a factory-installed insulated plenum and a stainless steel skirt for a convenient connection to the curb. The Coolerado ERV unit offers simple access to the air filters, motor assembly and controls for easy preventive maintenance. The units are also modular in design so they can be installed flush next to each other to meet increasing fresh air needs. Complete and accurate information is required. We will route your information request directly to the manufacturer or service provider on your behalf. Follow-up will come directly from the company.